"They have day while we have night and night during our day". So said the prayer Methodist congregations in Britain and Ireland assembled in February this year, in support of their brothers and sisters in Fiji. Unfortunately, prayers have failed to deliver miracles so the island brethren continue to practice their faith in conditions their European counterparts would've only experienced in the Dark Ages. Since February, the illegal government of Voreqe Bainimarama has sought to destroy Fiji's biggest Church by discrediting its political opinions and its leaders, as it rules that members can't gather, even for their AGM, until 2014. At last month's much-vaunted meeting, the junta cleverly divided the ranks by saying the government had nothing against the Church and that its only concern were the trouble makers in its midst. Weakened by fear, several ministers rushed to cast church president, Reverend Ame Tugaue, and church secretary, Reverend Tuikilakila, to the Lion's and in less than a day had suggested they step down. Tugaue and Tuikilakila have stood their ground so it was not surprising that in court today, the junta threw another charge on top of the one alleging they contravened the Public Emergency Regulations. Originally accused with 25 other church ministers, just Tugaue and Tuikilakila and three others were given the additional charge today. 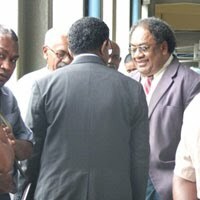 Fiji's illegal government has whinged about the failure of its critics to appreciate its fine ideals to 'clean up' Fiji, its decisions supposedly pure and transparent. But only a fool would believe today's court action was genuine. The 'well-being' Neumi speaks of was noted in the February prayer penned by the Methodist congregations of Britain and Ireland: "May all the people of Fiji work together for good, The Methodist Church, the Government, the Hindus, the Christians ... Till justice rolls like the waters of the ocean." One shares that hope for Fiji but one also hopes it wises up and stops turning the other cheek. Picture: Some of the ministers in court today. Fiji Village photo. since when does a military dictate...yes dictate...what church can or can't say or when they may meet... This is sinister and they know it. These mergency regulatuions are a k=joke as at some point all of thses coup makers will be quickly duck- shoving blame on to each other and claiming they had nothing to do with it. Exactly what was the emergency This is not Cuba or Burma....or is it? "clean up Fiji" is a shorter version of the Dictatorship's real mission: "clean up Fiji from anyone that doesnt agree with us". Will it ever be a case "And the meek shall inherit the world????" It's up to the Methodist Church to fight. As someone has said, they in one corner and regime in other. I say, send out their best otherwise it's purgatory for them. The Methodist Church has to fight back they can't give in or up. Let Tugaue a dhis general secretary lead the way, he seems to know something about resiting.